It was a quiet week at work -- school kids were still on vacation, and so most people took the week off as well. I got through a few things on my task list that had been sitting there for a while. Thursday played hockey, the first time in two weeks that I'd done anything aerobic. Felt pretty good, although by the 2nd period I was losing my legs. The league has done funny things with the schedule this year, and we played the 2nd place team in the division above us. They came out strong, but then played down to our level the rest of the game. We played a good game defensively and ended up losing 2-1. I got an assist. On Saturday Heather and I had the porcini risotto and veal piccatta yet again (I wanted to use up the leeks). Had a different pinot noir, which wasn't as earthy and so not as great a match (but still good). The porcini mushrooms are very earthy and the Sonoma Creek pinot noir we had the first time we made the dish were a much better match. I use dried porcini mushrooms, but I wonder if I can get fresh ones somewhere? I didn't use enough lemon in the sauce, and so we squeezed some lemon on after it was served. The pinot noir really picked up with the lemon juice -- it needed the acidity to bring out the taste. After we met up with Maricar and Robin and a couple of her friends at OverJoy. It's been a while since we've been there (it's often booked for private parties). Had a couple Keiths and were home by midnight. Got some more chores done in the house this weekend. 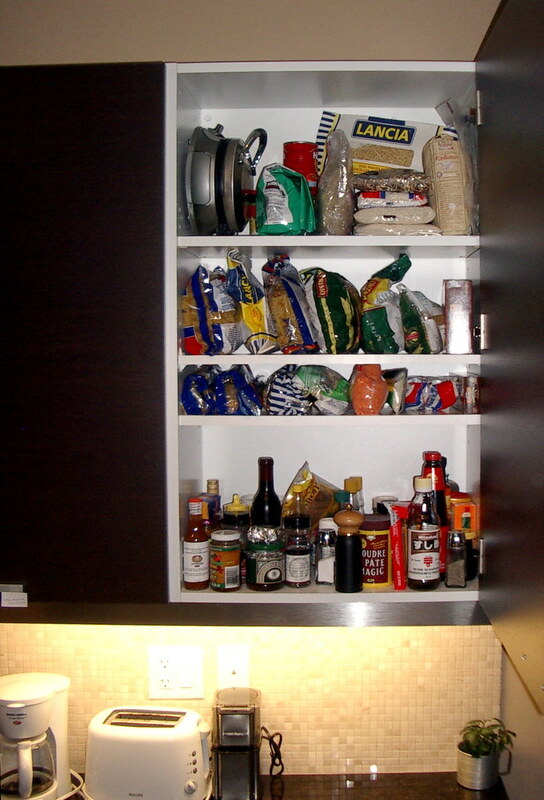 I'm a big fan of maximizing the use of kitchen cupboard space, and one big waste is empty space between shelves. 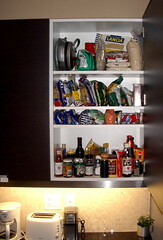 I installed an extra shelf (they're readily available at Home Depot etc) in the cupboard with dry foods -- so now our pasta and rice is all nicely arranged and accessible. I also got around to checking the humidifier. There's a label on the humidifier that says I should check it annually, so I dug up the instruction manual. The water dispenser comes out and I ran it under the tap to clear out mineral deposits. The humidifier is designed so that it cleans out most of the deposits automatically with the water drainage, so it wasn't clogged at all.